Holy Rosary Mission was fortunate to have Father Tom Lilly, (one of the ten diocesan priests assigned to the Archdiocese of Anchorage) visit Holy Rosary Mission from September 10th to the 14th. 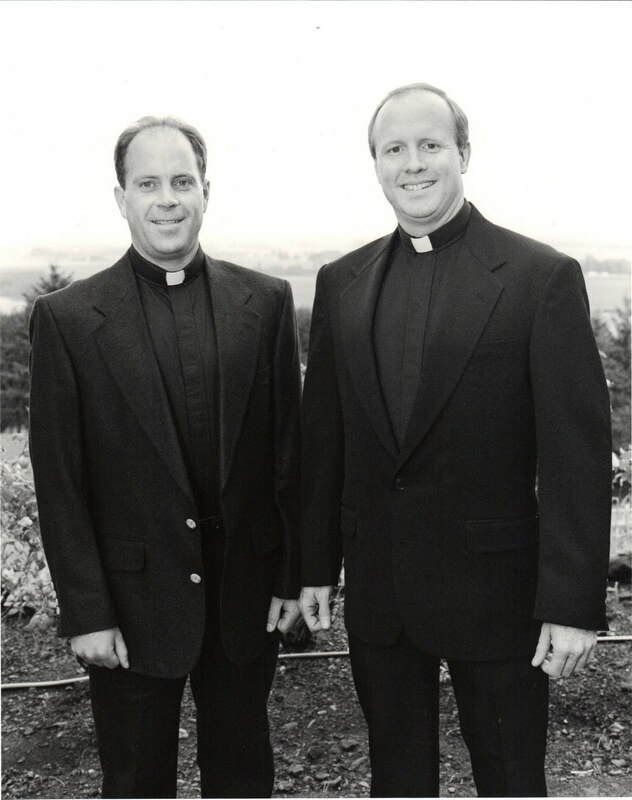 Father Tom and I both started Mount Angel Seminary the same day in August of 1996 and were both ordained the same day, May 14, 2003. Fr. Tom’s first assignment is Saint Elizabeth Anne Seaton (SEAS), the parish with the largest number of people in the diocese. My first assignment is the largest mission, geographically, in the diocese. We both started our first assignments in the summer of 2005. Fr. Tom and I just before graduating from Mount Angel Seminary. After five years of threatening to come to Bristol Bay, Fr. Tom was finally able to break away from his the busy SEAS. We gave him quite the adventure. The first day, Friday, September 10, we flew to Clarks Point, Alaska for Mass. Fr. Tom sat in Louise Gardener’s dining room as he held Brittany’s baby, Jack. We then flew over to Manokotak. Here is a video of Buzzing the closed old landing strip at Manokotak. Next we flew to the crash site of the late Father Jim Kelly, and back to Dillingham. After visiting the Flight Service Station, we discovered the coordinates to the Senator Steven’s crash site. We flew the seventeen miles north and circled while taking pictures and videos. Father Tom said a prayer over each of the crash sites. Here is a short video over and around the Senator Stevens crash site. A western view from the Senator Stevens crash site. The next day we jumped in the Cherokee Warrior II about 9:00 AM and headed for King Salmon. Along the way we did a GPS approach in to New Stuyahok. Fr. Tom is a private pilot with about 100 hours. The last time he flew a small airplane was over 20 years ago. I decided to let him get back into practice and fly the approach. He did a fine job! Next we landed at Levelock, Alaska because there was dense fog over the King Salmon runway. We descended through clear skies until about 200 feet above the Levelock runway. There was a thin layer of fog that we had to zip through before landing. We walked the mile and a half to the small village and waited for an hour or so for the fog to lift in King Salmon. Well, the fog never lifted so Fr. Tom and I flew back to Dillingham. When the fog finally lifted I left Fr. Tom in Dillingham and I flew to King Salmon. Plan B was to divide and conquer. We figured if the fog came back the next morning I would be stuck in King Salmon and could not get back to do Mass in Dillingham. Sure enough, the next morning after Mass at Saint Theresa in King Salmon I was stuck. Fr. Tom ended up celebrating Mass for the people at Holy Rosary in Dillingham and partaking in the delicious potluck without me. Monday, the 13th of September, we finally flew to King Salmon. Fr. Tom wanted to check out the Air Force base and I wanted him to visit Saint Theresa. On the way back Fr. Tom finally had a “reasonable” non-assisted landing in Dillingham. It was about his third attempt. Yeah Fr. Tom. Wednesday, September 1st, 2010 I flew our single engine Cherokee Warrior II to Egegik, Alaska (PAII). As the crow flies, Egegik is only about 60 miles Southeast of Dillingham. Circumstances suggested that I take a different route. After flying in the Alaskan Bush for five years I have found that single engine airplanes have several limitations that multi engine aircraft do not have. For more about Egegik, CLICK HERE. First is flying over water. Between Dillingham and Egegik one has to fly over close to forty miles of water. If a single engine should fail during the water crossing the only option is to land on the water, and well, freeze to death. When flying to Egegik I always fly around the bay and cross at the mouth of the Kvichak (Kweechak) River. This adds an additional thirty miles to the route. The following shows my route up to the Kvichak then down to Egegik. Second, although I am instrument rated and although our Cherokee Warrior II is instrument rated (IFR rated), I do not fly IFR unless I am in an emergency situation, i.e. the weather changes and I get stuck in the clouds. I also file for practice on nice days. If a multi-engine aircraft is above the clouds and one of its several engines fails, the pilot can normally remain airborne until a safe place can be found to land. On the other hand, if our Cherokee’s one and only engine fails while flying above the clouds, I would start an immediate descent and would blindly descent through clouds into, well, mountains, water, etc. Single engines aircraft can however, if the ground is visible at all times, seek out a smooth and hard enough surface to glide to and land safely if the engine fails. Third, icing is a problem for the much smaller and slower single engine aircraft, compared to the multi-engine. Single engine aircraft fly slower and therefore pick up more ice faster. Milti-engine aircraft are normally climbing or descending at a faster speed and will pick up ice, but not as much. Many of the multi-engine planes have de-icing capability whereas the icing equipment on our single engine Warrior II is too heavy and not feasible. Here are some early morning rain showers about 10 miles North of Egegik, Alaska. While flying to Egegik, another hazard appeared. Thousands of migratory birds winged past the Cherokee while on final approach to runway 30. I was trying to shoot a video but my camera fell off the dashboard onto the floor. I was too occupied watching the birds and trying to land the aircraft to pick up the camera and restart the video. To stay in practice in case I ever do get stuck in the clouds, I always fly a GPS approach into a new village I visit. The wind was favoring Runway 30. Final Approach into Egegik. After staying clear of the flocks of birds and landing on Runway 30, I took off again and took a picture of Runway 12 from the Northeast (I was basically over the village of Egegik when I took the pictrue). Eskimo word Egegik means "throat." Here is a picture of the village, which is located a mile north of the dirt landing strip. The "throat" is can be seen in this picture. Before heading home to Dillingham, I took one more shot of the beautiful little village. The old airstrip use to be located right in the village but they re-built it and moved it a mile or so south. I also took a short Vidoe of Egegik.